Thanks to capitalistic intrigues money has acquired purely illusory value, which can be cloned and multiplied without the presence of any labor or real value (Exhibt A: the band of the thieves from Wall Street Stock Exchange as the most advanced criminals on earth). This “money business” is just a fraud established to trap normal folks. With their deceipt in mind, I decided to use some real value for entering their fraudulent bank business. The festival (http://www.artalk.cz/2011/10/04/tz-festival-performance-malamut-2011/).took place in the city Ostrava, which was until recently a coal-mining city. After the “liberation by the Velvet revolution” the coal mining industry collapsed. Now it is the city with the biggest unemployment in the country. But at the same time it is a residency of the most wealthy man in Czech Republic, Bakala, who built his filthy wealth by “dealing” on the financial market with the apartments for the miners. I chose coal as the real value money exchange for with which to deal in the financial market. Today Coal is identified and used as a very popular hedge fund resource for our Wall Street thieves mentioned above. 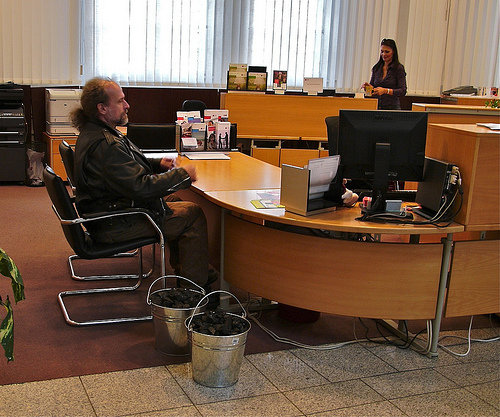 I made a trip to a local bank house with the plan to open a business account using, as the first deposit, two buckets of coal. To describe the experience from a performance I used two parts of a “real life” poem written in Czech language. 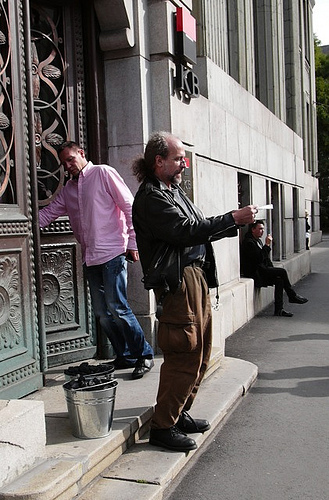 The first part (a kind of premonition) was written before the performance and red on the steps of a banking house. The second one was written after the performance and was based on the real experience from the performance. I am being kicked out on the street and the bucket with coal is flying after me. Let us get millions of buckets!! She is filling the application forms. And coal in my buckets is starting to smolder, dreaming about burning in the flames of a revolution while the human flesh is rendering down exposing the white bones. The clerk gets pale and runs for the bank director. “Take your coal of the table,” she screams at me red-faced. I am spouting the black soot into her sleazy face. Both ladies are staring at me. But they do not have ties so I can not grab them and yell into their faces. The security guard stops me at the door. “You will wait here for now! they yell at me. And the police officers are coming. “We demand all documentation will be erased,” screams the red-faced bank director. “Is there a bomb in your buckets”? one of the policeman asks me. “Maybe. In eternity there is always a bomb hiding. The police are leading me out of a bank. My buckets of black coal are swinging in my hands. Let us get millions of buckets!! !